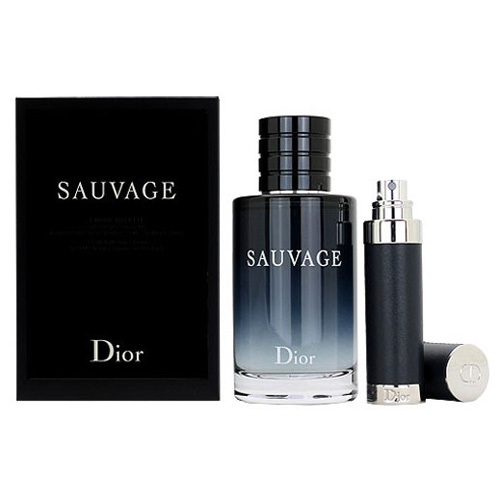 Christian Dior Sauvage Gift Set is ideal for men on the go. Christian Dior Sauvage Gift Set - Treat that special someone in your life to the exclusive Christian Dior Sauvage Travel package. The travel set features an 100ml and a 7.5ml refillable travel spray which complement each other perfectly, ideal for men on the go. When you add Sauvage to your daily routine, you are choosing to surround yourself in a raw and fresh signature scent. With a composition featuring natural ingredients and a woody base, this eau de toilette spray for men adds to your allure. Introduced in 2015 by the Christian Dior design house, this fragrance begins with spicy pepper trailing into a heart of soft lavender and hints of floral geranium notes. Cedar offers a masculine finish to top off this scent intended for a man who likes the finer things in life. 1 x Christian Dior Sauvage EDT 100ml. 1 x Christian Dior Sauvage Refillable Travel Spray 10ml.